iPad Art Room » NAEA 2016 in Chicago! The National Visual Arts Association Conference has been on my bucket list since I was a pre-service teacher. This year, I was so fortunate to be awarded the Athena Fellowship by my very supportive school, St Hilda’s, and contribute to this incredible event. This year, NAEA in Chicago attracted more than 5000 art teachers, and many hundreds of museum an tertiary educators from across the United States were in attendance, so as you can imagine the breadth and diversity of professional learning on offer was truly overwhelming. With a very full program, I tried to make the most of every minute, often running from sessions on circuits and robotics in sculpture, to presentations on divergent thinking, and art therapy for student well-being. Contributing a workshop in this context is a privilege. I had a full house for my workshop, where I shared the creativity of students from my own school, as well as providing a context for their work as part of an overview of practices in Visual Art from around the world. To offer my perspective from across the globe, and be a part of such an important dialogue at an American National Conference, was certainly special. It was also fabulous to meet so many of the people who make up my personal learning network and are a constant source of inspiration and support to me in this vocation. As this network strengthens and grows I believe it is a significant advantage to my practice, and the programs we offer here to the girls and beyond. 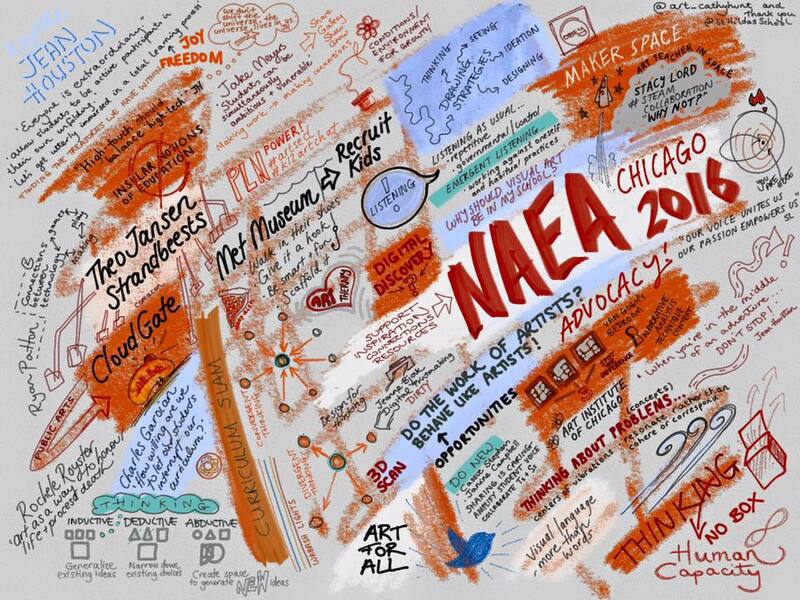 Jump into the journey by checking out this sketch note summary of my NAEA experience, and scrolling through twitter storyify below.